1.Wireless 4.1 technology ensures transmitting strong signal in high quality and high speed. Offering clear, distortion-free digital audio. 2.3.5mm audio and digital optical toslink inputs and outputs provide strong compatibility to a wide variety of devices, flexible connection. 3.Mini and light-weight, very easy to carry and custody. 1、Bluetooth Receiver change the traditional speakers or headphones into Bluetooth-enabled ones. After paired, play music wirelessly from your Bluetooth-enabled Smart Phones, Tablet and more without the hassle of cables. 2、Two functions modes(2 in 1 transmitter receiver)and dual connection(3.5 aux or optical audio)let you channel more wirelessly music than ever before. 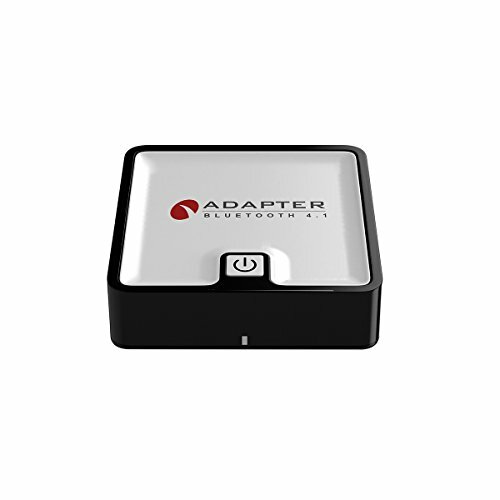 3、Bluetooth Transmitter can be connected to the audio devices (such as MP3, MP4, TV and PC, etc.) without Bluetooth function via the included 3.5mm audio cable or optical Toslink cable, and making it work with Bluetooth-enabled Headset and Speaker. 4、When transmitted over a Bluetooth connection, aptX Low Latency Technology enables high quality and low latency in audio, making the sound stay in sync with the video, giving you a perfect synchronization audio and visual experience. 5、In transmit mode, Can pair with two Bluetooth-enabled headphones or speakers to play music simultaneously. In receive mode, it can pair with two smart phones at the same time. You could choose any mobile phone to play music, but the other one need to pause or end the music.